I have a race of very non-humanoid aliens, let's call them Zoblings, and they find an English Dictionary. These aliens are being oppressed and exploited as a resource by the humans because they don't realise they are dealing with intelligent creatures. During a raid the Zoblings find an English Dictionary. Given that they can recognise that these symbols have meaning to the Humans, could they learn to at least write in English without the aid of a human? 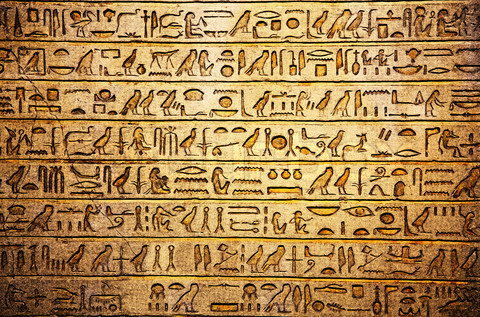 Given that you can recognize that these symbols have meaning to the Egyptians, can you learn to at least write in it without the aid on an Egyptian? The above could be a dictionary or a grocery list, there is no difference to you. The Zoblings are going to have the same problem we had when trying to understand the Egyptian hieroglyphics. We were only able to understand these hieroglyphs when we found the Rosetta Stone, since we then had a reference for what the symbols mean, not just what set of symbols they had. It's not even enough to hear the humans speak, since the Zoblings will have no way to understand how any letter is pronounced and thus can't match spoken words to the written words. Unless the Zoblings can get a human to give examples to words in the dictionary or find some translation of a few words into the Zobling's language, they won't be able to decipher the meaning of what the weird symbols in the dictionary are. However, if the end goal is just proving that the Zoblings are intelligent, then they have better options: mimicking humans sounds/actions to show they understand human are doing something, coordinating themselves to perform some patterns like tapping their feet a certain number of times over and over again until the humans pay attention, etc. I'm assuming that by "learning to write in English" you mean actually writing meaningful texts in English, rather than just copying out words without any idea of their meaning. In order to do this, the Zoblings must be able to hear the humans speak, to parse their speech somehow, and to match it with texts, so I guess they must catch humans in the act of reading aloud from a text that the Zoblings can get a hold of, or at least see. This is no mean feat. I mean, would you manage to learn how to write in a language you know nothing about, written in an unknown alphabet, just by looking over the shoulders of people as they (for some reason) read aloud from a text? The dictionary is a mere detail. It would give the Zoblings the chance to study the alphabet, punctuation rules, etc. But unless the Zoblings can force a human to read aloud from the dictionary in their presence, they don't actually need it. At the stage where a monolingual dictionary is useful for comprehending a language, you must already know a lot about the language in the first place. Your best bet is to have the Zoblings learn English in the same way as most humans learn languages: by listening to it and interacting with the speakers. The dictionary will help them afterwards. It would surely be very difficult. But would it be impossible? Probably not. How smart are they? Deciphering an unknown language is very hard. Giter mentioned ancient Egyptian and the Rosetta Stone. The Rosetta Stone had writing in three languages: two versions of Egyptian and Greek. Archaeologists guessed, correctly it turned out, that it was the same message written in all three different languages. As they knew Greek, they knew what the Egyptian said. Even at that, it took over 30 years from the discovery of the Rosetta Stone before significant progress had been made in learning to read the Egyptian language. If the dictionary has pictures, that could give a jump start. Like if I found a Zobling dictionary and there was a picture of a frog next to the word "drabnatz", I might guess that "drabnatz" means "frog". Then I could look for other entries that use the word drabnatz and speculate that those words might be related to frogs in some way. Life if I identified many words for different types of amphibians, and then an entry that mentioned several of these, I might guess that is the word for "amphibian". But wow, that would be hard and slow. I wonder now: Has anyone ever deciphered a dead language without having any translations of text from that language into a known language? I don't know of any but it's not my area of expertise. A regular dictionary would be useless. It is designed to help someone able to read read anything, but gives no help learning to read. A dictionary with some pictures might be useful to a clever enough people though. The first step would be noting that the same symbol group appears both in an entry and a caption on the same page, and figuring out what entires and captions are for. After enough study it might be found that every symbol has its own page, and almost ever symbol group has an entry with at least a similar left side. But if they have a picture of something that exists and a caption relating to it they don't need to bother learning to read to show us they are intelligent, just put the caption's symbols near the real thing. Or even easier just write any of our symbols anywhere. So far no non-human has taught a non-human to write any particular symbol, so that would be a big eye-opener. If they appropriated our symbols to transcribe their language (if they don't have language the whole thing is hopeless) they could pass notes between themselves which any human would very quickly identify as intelligent. H Beam Piper's Omnilingual may be of interest. In it, humans find the remnants of a now extinct Martian civilization. After finding Martian texts humans become extremely interested in deciphering the Martian language, but have difficulty because there are no Martian-English texts. Maybe the Zoblings find a high school science textbook and follow suit. We have examples of this from our own history. Faced with an unknown language we can decode the parts of speech but not the meaning of words. A dictionary will be of no help in this--it will give them more information about the relationship of words but not what any of them mean. You say they are intelligent, though--that means they have another language to use. Math is universal. Ever see those puzzles where you are presented an equation with things in place of numbers and need to figure out the numbers? Note that that's easy enough to be used a puzzle, not something you need scientists for. A regular English-English dictionary will be useless without any other reference. However, if Zoblings are lucky to get their hands on one of the elementary dictionaries for English learner's and they have some linguists they might be able to master about 1000-2000 words needed for basic communication. Unlike regular dictionaries, dictionaries for English learners come with pictures (both for nouns and verbs), are written in the simplified language (their vocabulary and grammar are limited), have extensive explanations and tons of examples. Moreover, the most important and frequently used words are highlighted. It will not be an easy fit even assuming that Zoblings are highly intelligent. I would also assume that their knowledge of grammar will be very limited unless they find some grammar books. It is also important to consider that languages reflect environments, physiologies, and cultures. If Zoblings are unable to observe humans and their physiology is significantly different from human the cultural barrier can be too high. Real linguists start to learn languages in native settings by learning the words for body parts, objects in the environment, and basic actions. This creates a common frame of reference. However, if there is no common frame of reference comprehension can be significantly impeded. Even pictures can be of little help if Zoblings cannot put them into a right context. What would cause an alien species on an alien world to behave in a (specifically) repugnant way? What would a modern civilization look like if they aren't allowed to write? Aliens performing successful medical procedure on humans at first contact?